It’s generally believed that Constance poisoned the family, and it was she who washed out the sugar bowl before the police arrived. There was some doubt about her guilt though, so she was cleared of blame and released. Now she never leaves the house. Neither does Uncle Julian. Only Merricat ventures into the village, twice a week, on a Tuesday and a Friday to go to the library and to get provisions from the village store. She hates going, but someone has to or they would be without food. Merricat hates the villagers and they return the feeling. They hate all of the Blackwoods and it is a ‘them and us’ situation that existed long before the poisoning. When the village people taunt her Merricat consoles herself by imagining that all kinds of terrible things are happening to them or, alternatively, she pretends that she is on the moon. She believes things would be better there. She is a strange girl and you don’t have to get very far into the story before you get suspicions about who really laced the sugar with poison. We Have Always Lived in the Castle is not a long book—my copy runs to just 146 pages—but it is a very good story. There is a mystery aspect to the tale because, even if the reader has his or her suspicions about who poisoned the sugar, the truth is not revealed until the end of the book. It is also a sad story. Sad because of what happened at that fateful evening meal, and because the three survivors have become prisoners in their own home. Constance seems to live for her cooking, Uncle Julian is obsessed with what happened, and Merricat—who appears quite content with her life—spends a lot of time escaping into fantasy worlds. All three of them share a strange and unhealthy existence, but life goes on. Few people ever visit the Blackwoods, but once a week Helen Clarke comes to tea and during one visit she urges Constance to try and put the past behind her and get back out into the world. This worries Merricat, who seems very threatened by the idea. She is happy with things how they are. Then, later still in the book, their Cousin Charles arrives and Merricat, who sees this as a possible beginning to the end of their way of life, feels more threatened than ever. At this point in the story, I began to worry about how such an unstable character might respond to the threat, but the real turning point in their lives comes when there is a fire at the house. After that things are never the same again. We Have Always Lived in the Castle is a great book. It paints a startlingly accurate picture of the darker side of human nature and the story is so well written it’s hard not to have an emotional reaction to some of the subject matter. For instance, after the fire, when the villagers march into the house and begin destroying the family’s possessions I felt angry and disgusted, many readers may feel the same. It’s the sort of scene that makes the blood boil. 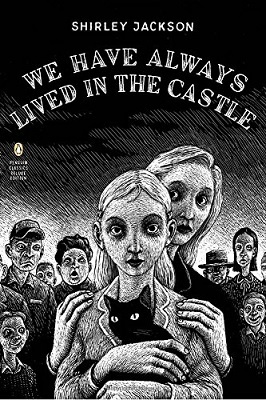 We Have Always Lived in the Castle is a horror story, so it does have its darker moments; overall though, I found it to be a very sad story that is, as much as anything else, about wasted lives. However, this is the kind of book that will speak to different readers in different ways.